The last couple of weeks have been pretty active for me. I’ve moved in a bit on choice foreign KTK block boxes that I think have great long term upside and I even picked up a couple of boxes of Japanese MM2 boxes that I expect to have solid mid-term upside due to their relative rarity and their use of normal tamper-proof, quality controlled, booster wrappers. I also through some money at some nicely priced Korean Theros block gods since a few of them are likely to show up in Modern sooner or later, and the others have great casual/EDH chops. My other purchases were the usual crop of opportunistic late night Ebay snipes. Pucatrade helped me out another Tarmogoyf at close to full value. I bought a couple at $135USD at GPToronto, so this was an easy $100 increase in value. Once my latest trades are confirmed I’ll be holding about $1200 in Pucapoints, and on the hunt for Power 9, dual lands and Judge foils. If you have anything like that you want to send my way let me know. MM2 is turning out to be a dramatic release indeed. First we had the overreaction to the lack of compelling rares and uncommons and widespread misinformation about the EV of the set (hint: it will turn out fine.) Now, with packs being opened across the planet, we’re seeing plenty of evidence of a highly dubious collation process, packages that can be tampered with easily, damage to cards from the new cardboard packaging and foils being replaced by placeholder cards. As the highest profile release of the year, and with packs at $9.99 MSRP, WOTC really should have put more effort into nailing this down. Shame. 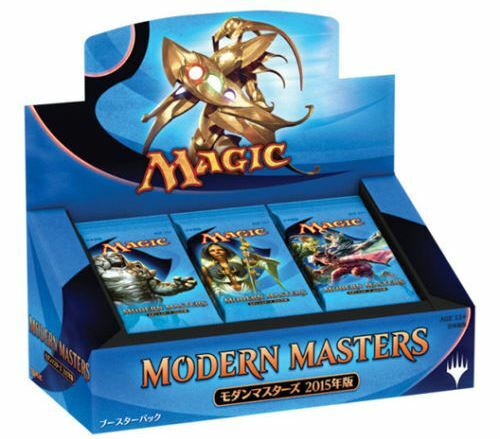 If the quality control of English boxes proves out to be suspect, the value of Japanese boxes (which use normal booster packaging) should increase, since MM1 was English only and Japanese vendors are technically forbidden from selling their boxes overseas. Picking up a couple of these as close to $300 as possible should serve your MTG portfolio well. Pricing on key MM2 cards has already started the predictable downward spiral. I recommend holding off for now, and jumping into the fray coming out of the triple GP weekend as mentioned last week. With the Euro at a low point against the USD, CardMarket.eu has some intriguing arbitrage opportunities on older, high value targets. Poke around and you may find some stuff you can buy list for a couple of hundred bucks. Buy listed some DTK that I believed had spiked the last 2 weeks. The Jace’s I grabbed because of Guo’s spec from a few days ago. Keep up the great writing and specs. First, if you didn’t see my post thanks for using my info and the shout out in your Boosters vs Fat Packs article. Love your foreign box buys but I’m not sure about Jap MM2015 at $360 each if that’s USD. I’ve been picking up foil playsets of some FRF cards where the buylist price at my LGS is greater than my buy price (and with store credit bump I’m automatically making money if I sell now). Since you are an active seller/trader online you probably could make a quick killing. Don’t know if people have been saving up money for MM2015 or DoT but fate cards seem to be plummeting or are at least really good buys on ebay. It’s probably too late to really cash in on Collected Company foils (only targeting foils now) but players LOVE the card and it is fun so I think the foils still have some value and room to grow (it’s much more versatile than Siege Rhino in both use and casting cost and foil Rhino is $20ish now and at much great supply. Similar comparison to foil Digs). Plus we are a ways away from Origins but u could Collected Company for Origins Liliana at your opponents EOT so I wonder what else you will be able to target with it in the next sets. Plus Raptor and Den protector are green cards with cmc 3 or less. Actually as I double checked price on ebay before posting this comment I don’t even see Foil Company at $20ish anymore so getting in at $13 feels GREAT. What exactly is your foil humble defector of $10 cause that doesn’t sound right? Oh lastly, with SCG NOT airing legacy on Sundays dual land prices seemed soft and I picked a few up. With SCG Worcester broadcasting this weekend I’m monitoring prices closely to see if they rebound or if I should abandon the dual land investment strategy. I’m going to one up you James. Pack pulled Tarmogoyf sold @$193.66. Just picked up a playset @$130.00 each. You didn’t make $100 on those Tarmogoyfs. Puca points are selling for .75 to .80 so if you calculate the real money value of the points then at .75 you actually got 142 for the tarmogoyf. It’s still a profit but not quite what you thought. Hey D. You’re correct to note that Puca points don’t equal cash, and if your plan is to cash out into USD, you do need to be doing that math. The system is fortunately not a closed loop however and opportunities abound to get sent cards at full value, at which point you do your fees calc. You’ll note that I denoted value achieved, rather than profit, and kept the Puca sales separate. Further, the site needs to fix the log jam of points by motivating more high end transactions. Once they figure that out, points should rise to closer to .90. If you’re savvy, puca points=cash. So weird that there is only one author bought in this week. It is one of the best week for opportunity to gain some profits from. 1) MM2015 has decreased its price due to the disappointment of the spoiler in the last lot. I still think the EV is almost the same as MM original and the price of some cards may rebound a little. People are complaining about the quality of cards but I don’t really care much as long as you don’t open packs. From all the complaints, on the bright side, it might actually lead to that this set will be the last set that they will do this recycle thing and make this set even more unique. Don’t know whether this uniqueness will relate to future price but I like it somehow. 2) KTK (JAP) : I don’t really need to explain. 3) CNS : Here is what I put some bets on. This is a very unique set. The mechanics are fun in EDH and very very difficult to get reprinted. Cards like Will of Councils or Dack Fayden sees played a lot in Eternal Format. Dethrone will not see reprints for years . If there will be CNS2, I don’t think they will repeat same mechanics cause it makes cards boring. You can find boxes at lower than $89 while the highest foil cards you could get from the set is around $400 (Dack Fayden Foil). Not to mention Brainstorm(Common Foil)/ Will of Councils(Foil), Exploration (Foil), Scourge of the Throne (Foil), Swords to Plowshares (Uncommon Foil). These cards are ridiculously expensive. And they will define the future prices IMO. 4) Sorin / Sarkhan : The planeswalker curve is about to begin. This is just my first lot. I will do it more heavily in the next two months. Are you still in hard on See the Unwritten, or does it become See the Overlooked because of Collected Company? just thought that i would note that some of the foil discard fillers are going for around 100 dollars a piece to misprint and oddity collectors. this price may come down as more product is opened to determine how many are out there.